I was suddenly reminded last night that there are a few things you just can't get away with in an interview. Farting is on the top of my list. My fee was lost in less time than it took to find fresh air. Besides ruining the atmosphere and clearing the room the shock factor is too great for most to get over.... especially if you're a stunning redhead with a flawless resume. refer to his secretary as "toots"
make a big deal about suddenly realizing your fly is down. I offer these tips up in the hope you will pass it on to your job hunting friends and candidates. I will never be able to enjoy a cinnamon dolce latte grandee again - the memory will linger for ever. Under siege from layoffs, outsourcing, off-shoring, rightsizing, downsizing and bankruptcies, America is in the midst of a profound business transformation. It’s the result of developments in information and communications technologies, changing human values and the rise of the global knowledge-based economy. The sheer complexity and technical sophistication of business has transformed the job market - not just here in America, but around the world. Business is becoming knowledge-based as well as technology intensive. Knowledge workers are now the backbone of America. They are employed in all sectors of the economy, most prominently in the information technology and communications sectors, but also to a growing extent in healthcare, manufacturing, education, finance, natural resources, defense and government—in any field that requires innovation to sustain competitiveness. Competitive advantage is rooted in the new ideas of these skilled workers. Of the 120 million skilled workers in America today, 24-40 million change jobs every year. Many people needlessly drift in and out of dead-end jobs because they don’t know which industries have a future in this new America, or how to present their value in the right terms to the people who can hire them. Already reeling from outsourcing and the struggling economy, competition for the remaining U.S. jobs is tougher than ever, the rules for getting them have changed, and global competition will ensure the rules will change again tomorrow. No government agency, educational institution or think tank has a genuine crystal ball to make a call on the future; there are simply too many unknown factors when it comes to industry and job creation. One thing is certain, whether you are employed but unhappy, or unemployed and in need of a new opportunity; you as a job-hunter are at a strategic fork in the road. Are you ready to take control of your life? 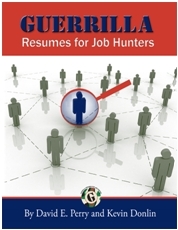 Are you ready to become a Guerrilla Job Hunter?